Once again all the other stuff in life has been getting in the way of the blog. But that doesn’t mean we haven’t been eating. This herb crusted salmon went down well. 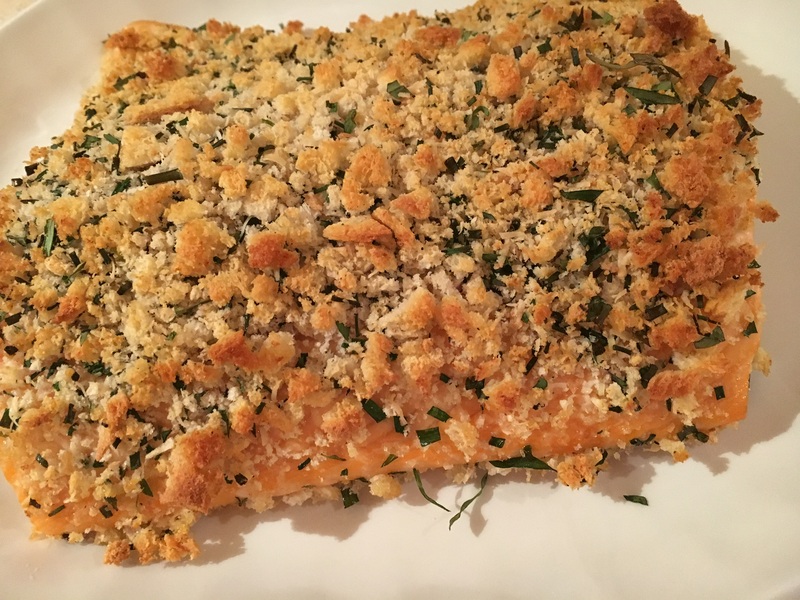 It was small side of salmon, baked for about 20 minutes, with a crust of breadcrumbs, Parmesan and chopped herbs. In this case I chose tarragon and parsley – a lovely delicate flavour. I served this with a green salad and some gorgeous Ratte potatoes from Ocado. Apparently these are a traditional French variety, with a unique chestnut flavour and smooth creamy flesh. Sounds about right – try them, they are most excellent. 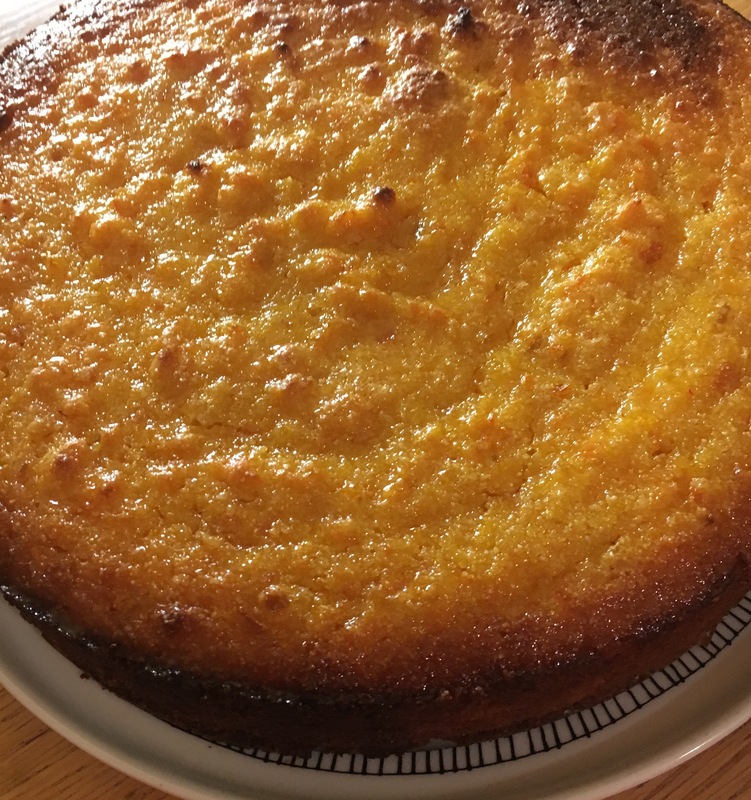 And then in an idle moment (as if) I made this clementine, saffron and polenta cake, taken from an old Waitrose magazine that Grandma Battenburg passed on recently. I do love a ground almond-based cake – they stay moist and tempting for several days (well, I believe they do, this one didn’t last long at all). Put 6 whole clementines in a large saucepan and cover with water. Bring to the boil and simmer for 40 minutes. Drain and leave to cool. Preheat the oven to 180C, gas mark 4. Grease and line the base of a 23cm springform cake tin. Put the clementines in a food processor (skins and all – I wasn’t sure at first but having done it this way, I’m sure that’s right) with the saffron and whizz to a purée. Transfer to a bowl and beat in the eggs, plenty, almonds and250g of the sugar. Pour the mixture into the tin and bake for 50 minutes to an hour, or until a skewer inserted into the centre comes out clean. Turn out onto a serving plate. Using a potato peeler, pare the rind from the remaining clementines and cut into the in strips. Squeeze the juice into a small pan, add the rind, plus the remaining 100g of sugar and 100ml cold water. Stir over a gentle heat until the sugar has dissolved. Increase the heat and boil for3 minutes. Make a few holes in the top of the cake with a skewer and pour over half of the syrup. Leave in the tin to cool for 10 minutes before turning out. Slice and serve with creme fraiche and a drizzle of syrup. Not only very tasty, also gluten-free, which is handy for some of my friends and fellow cake-consumers. Both these recipes are reasonably straightforward and you can knock the salmon dish up quickly after work, if you feel so inclined. In fact, if you get ahead with the boiling of the clementines, you could get the salmon prepared and baked while the cake is doing its thing in the oven – a little dinner menu for you right there.